Thanks to Facebook's Urmas for letting me know the surprising news that Estonia has become--so far as I know--the first former Soviet republic in Europe (Azerbaijan and the rest of the Caucasus, perhaps, excluded--thanks for the correction, Anatoly) to experience an excess of births over deaths since the fall of the Soviet Union. Yes, there seems to have been some improvement--I posted recently about Russia, after all--but it still stands out remarkably. Compare neighbouring Latvia's ongoing collapse. According to the revised data of Statistics Estonia, in 2010 35 people more were born than died. The population of Estonia was 1,340,194 on 1 January 2011. 15,825 people were born and 15,790 people died in 2010. The number of births exceeded the number of deaths last 21 years ago in 1990. In 2010, 62 children more were born than a year earlier but the number of births was still smaller by about 200 than the last decade’s record in 2008 when more than 16,000 children were born. On the contrary the number of deaths has been rapidly decreasing during the last three years and in 2010 291 people less died than a year earlier. 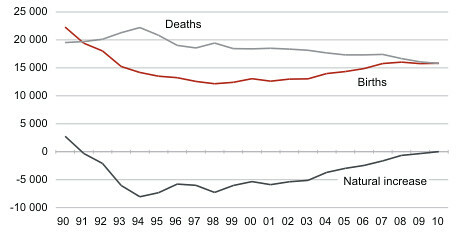 Thus the positive natural increase was mainly achieved due to the decrease in the number of deaths. 617,757 males and 722,437 females lived in Estonia at the beginning of 2011. Population growth continued due to the natural increase in Harju and Tartu counties. Harju County's is Estonia's most populous, its 524 thousand people amounting to 39.2% of the Estonian population, while Tartu County is Estonia's third most populous, home to just shy of 150 thousand people and 11.2% of the total population. It's noteworthy that Idu-Viru County, Estonia's third by population and located in the northeast of the country around the city of Narva on the Russian frontier, does not figure in this; so far as I know, Ida-Viru is continuing to experience continued natural decrease. I've a draft of a much longer post hidden in the archives. Briefly, I would like to say that this all fits with my noting of with ethnic Estonians now inclining to a relatively Nordic pattern (relatively high fertility, significant postponement of births, very significant extramarital fertility) and Russophones behaving in the opposite manner. See Puur et al. 's brief abstract "Fertility patterns among foreign-origin population: the evidence from Estonia" for an outline. The analysis reveals a remarkably strong contribution of foreign-origin population to the total number of birth. In the 1970s and 1980s it accounted for more than a third of births registered in the country, leaving a long-term imprint on the ethnic and linguistic composition of the population. The cessation of massive inflow after the turn of the 1990s has somewhat reduced the proportion of births to women of immigrant background. In the recent years it has accounted for less than 30% of the total. The comparison of completed cohort fertility rates allows to distinguish between two different patterns among women of immigrant origin born during the 20th century. In older cohorts, born in the first quarter of the century, the foreign origin population shows noticeably higher fertility, reflecting the later onset of fertility transition in the regions from which the immigrants originate. The progression of fertility transition in the latter resulted in the continuous decline and the convergence of levels with the native population in the birth cohorts of the late 1920s. However, the state of convergence proved temporary and in the generations born in the 1930s and later, the levels diverged again with foreign origin women having a systematically lower fertility compared to their native counterparts. The examination of parity progression ratios and the ultimate parity distribution reveals that the lower completed fertility stems mainly from the less frequent progression to a second, and in particular, to a third birth among the foreign origin population. Compared to the native population, the corresponding measures have been twice or even more than twice lower, demonstrating the largest difference across parity distribution. On the other hand, the proportion of women with one-child has been markedly higher among immigrants. At the same time it is interesting to note that childbearing has typically occurred at an earlier age among the foreign-origin population. Meanwhile, as Lars Agnarson notes in his paper "Estonia’s health geography: West versus east – an ethnic approach", partly because of Russophone concentration in Soviet-era industry--exactly the sorts of industries which got hit by the post-Communist transition--Russophones evidence significantly higher mortality than their ethnic Estonian co-residents, mortality rates apparently rising in proportion to the homogeneity of Russophone communities. Between 2000 and 2009 the populations of ethnic Estonians and ethnic Russians each decreased by roughly nine thousand, but the ethnic Russian population is less than 38% of the size of the ethnic Estonian. What does this imply? For Estonia as a whole, last year's natural increase might indicate that Estonia is moving from a post-Communist demographic system (low fertility, high mortality) to a Nordic one characterized by relatively high subreplacement fertility, low mortality, and a post-modern approach to family relationships. The question of emigration is noteworthy, and over the 2000-2008 period Estonia does seem to have seen the emigration of 13 thousand people. The volume of emigration has been significantly less than in Latvia or Lithuania, however, and much of it has been directed towards a Finland that is both geographically and culturally quite close to Estonia, Helsinki and Tallinn being separated by no more than a ferry ride. Much of what Estonian emigration has developed may be more temporary in nature. Estonian-Finnish migration is even bidirectional: Estonia can offer job opportunities for Finnish workers, too, and the lower cost of living in Estonia compared to Finland may be a long-run advantage. It's also worth noting that a relatively less dire demographic situation than that of neighbouring Latvia may well provide Estonia with if not advantages, fewer disadvantages--including economic ones--over its southern neighbour, and others, too. Within Estonia, if the past two years' sustained difference between a relatively high fertility/low mortality ethnic Estonian population and a relatively low fertility/high mortality Russophone population remains, then the continued shrinkage and aging of the Russophone population is inevitable. This will have significant effects on everything from the spatial distribution of the Estonian population (what will happen in the northeast) and the futures of economic sectors depending heavily on Russophone labour to the balance of political power in Estonia and Estonian relations with its neighbours. Expect more later, please; consider this a taster. How much of the gross birth/death rate differentials is related to core differences between ethnic Latvian and Russian fertility rates and life expectancy, and how much of it is related to the greater average age of Russians (seeing as many younger ones emigrated back in the 1990s) and possibly continuing higher emigration on the part of ethnic Russians? Not only Azerbaijan, which has had continuous natural increase since the USSR, but also Armenia and Georgia. I found Bulgaria, EU 'Demographic Bailout', and the New Frontier a solid analysis of the demographic prospects of another EU fringe area. The 1990s emigration has an impact on natural increase/decrease, but it doesn't relate to cohort fertility--compare the issues Russia may face with its higher fertility in the much-diminished 1990s cohort. The differences in completed fertility per woman between ethnic Estonians and Russophones have been enduring--in the 1980s, frex, ethnic Estonian fertility was slightly above replacement while Russophone fertility slightly below. Relatively higher Russophone natural increase in the first decades after annexation was an artifact of the relative youth of this population. As average ages converged, this artifact disappeared. The similar phenomenon of ethnic Latvian and Russophone fertility differences, on the pattern of Estonia, might have existed in Latvia, too, but not to the same degree. One thing separating Estonia from Latvia is the nature of the immigration. In Latvia, Russophones are dispersed throughout the country. In Estonia, in contrast, they're concentrated overwhelmingly in two out of 15 counties, are a minority in Tallinn, and a majority in only one. To a considerable extent, ethnic Estonians and Russophones live in parallel. Latvians were a minority in six of the largest cities in Latvia. Even in the capital city of Riga, Latvians had shrunk to only about a third of the population. by 1989 they had become a minority of the population in the usually most active age-group of twenty to forty-four. In the age category of thirty-five to thirty-nine, Latvians were down to 43.0 percent of the total. The relatively low Latvian demographic presence in this group could partly account for the much smaller visibility of Latvians in the privatization and business entrepreneurship process within the republic. The greaer extent of mixture in Latvia as opposed to Estonia plays a role in what I think--think; I had to guestimate in Latvia's case, unlike Estonia's--the diffusion of demographic norms across ethnic boundaries. The first city of Estonia (Tallinn) by population has a three-fifths Estonian majority, the second (Narva) an overwhelming Russophone majority, but the third (Tartu) and fourth (Pärnu) overwhelming Estonian majorities, as do the rest of Estonia's communities (save in Idu-Vira, as mentioned, and some parts of Harju like Paldiski). Things in Latvia, as you point out voraratis, are altogether different. Calling Azerbaijan part of Europe is really stretching definitions, no matter what the Azeris might prefer. Thanks Randy, this was a good read - even if the facts were not new for me, some of the insights are. Looking forward for more! You are writing: "The first city of Estonia (Tallinn) by population has a three-fifths Estonian majority, the second (Narva) an overwhelming Russophone majority, but the third (Tartu) and fourth (Pärnu) overwhelming Estonian majorities." Here is small mistake. Tartu (not Narva) is second largest city.